Gratitude. Aaaahhhhh. I just love moments of gratitude. How fortuitous, then, that practicing gratitude is a scientifically proven method of deepening one’s own well of happiness. 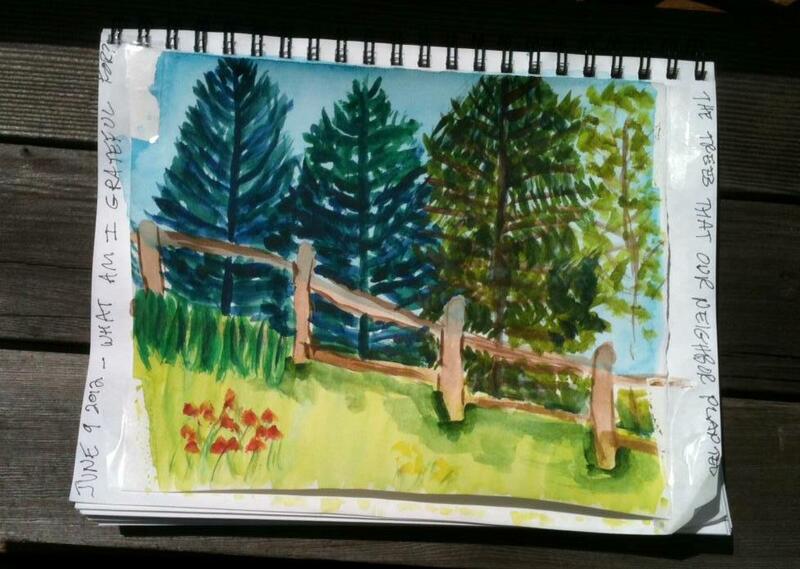 Happily, while listening to Lyubomirsky’s book during my long drive from Vermont to Alabama last spring, I had an “aha moment” — rather than write about happiness, I would pull out my watercolors and create a weekly gratitude painting. Perfect! Okay, so the weekly painting turned into a monthly painting and I skipped April altogether (hmmm, could that have something to do with helping my daughter care for a newborn???) — but I stuck to it. It’s working. I have weeks to contemplate the subject of my next painting; thus, gratitude is frequently on my mind. My first gratitude painting. I am often surprised by the subject matter that comes to the top of the list when I sit down to paint. So my mental pump was primed when I stumbled on Ken Wert’s “Meant To Be Happy” blog list of 48 unconventional things for which he is grateful. His list ranges from toilet paper (this makes me smile) to gears (yeah, okay, I can see that) to color (yes, yes, my heart is singing!) to hugs and voice (deep sighs of appreciation). It’s a pretty darned good list. Wert’s list, and the many expressions of gratitude I heard at the Happiness Conference in Seattle, made me wonder: what are other people grateful for? To find out, I put out a few group emails, and changed the question on the blackboard in front of The Happiness Paradigm to, “What Are You Grateful For?” Naturally, the blackboard collected shorter answers: “Obama,” “Fall in Vermont,” and “blankets.” The written answers, on the other hand, are wonderfully thoughtful — perhaps precisely because writing takes more thought, and perhaps because almost everyone who responded is involved in some way with the happiness movement. Their responses are below. Before you read them, though, I’d like to ask, what are YOU — the person reading this, right now — grateful for? This collection is neither scientific nor comprehensive, but the more answers the better, because this is good food for thought for all of us. So please feel free to post a comment or send an email with your own answer to this question. I am grateful for my Mom who taught me I can do anything! Immense gratitude to all who call forth the most thriving possibilities for humanity and the fullness of life. The call to happiness and compassion has deep roots even beyond the measurable and our time together was soul food. Grateful for all the help from near and far in taking care of a new baby — babysitting, onesies, toys, students taking care of the baby, support from family, etc. Can barely name it all! I am thankful for old clothes that seem to melt into my body this cold September morning, one that marks the beginning of Fall, a season I love best in New Mexico. And I am grateful for the happiness class I began teaching last week on the anniversary of September 11th. I am grateful that in spite of such darkness in the world we can gather in places like Albuquerque, Seattle, and Maple Corner,Vermont to promote happiness. I am grateful for: 1) My spiritual teacher Sant Kirpal Singh, and my meditation practice. 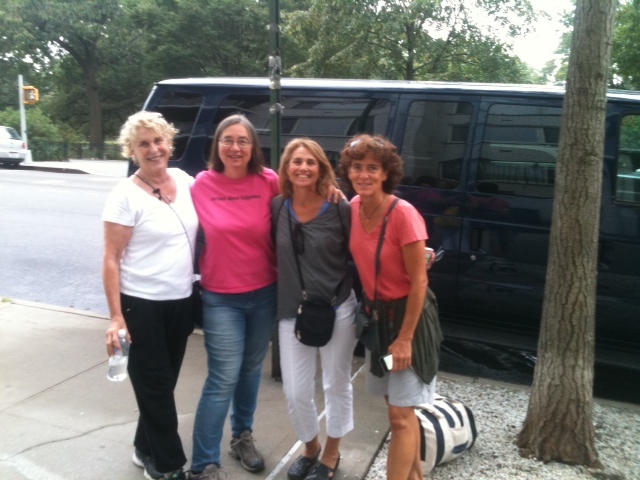 2) Fran Joseph’s uplifting Laughter Yoga Certified Leader training last weekend–and Laughter Yoga itself. 3) My kindred-spirit office mates. Sleep — it’s like a miracle every night. Shooting stars, and being able to see the Milky Way. I am grateful to have such a good friend in YOU! I am grateful that the conditions of my life allow me to participate in the arena of enhancing happiness, compassion, community, and creativity; I am grateful that I am surrounded my many whose lives are about lifting the spirit of those that they touch; I am grateful that I live in a place where I have access to nature, culture, and really good food; I am grateful that there are so many people in my life that I love and appreciate; and I am grateful for the authors and film makers that create or capture stories that are captivating and meaningful. 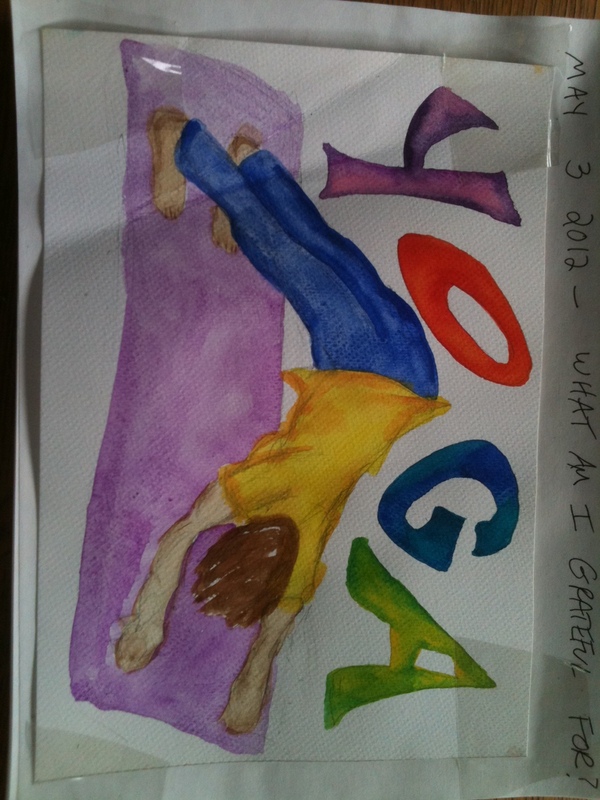 My gratitude painting for May — grateful for yoga! While eating corn on the cob last night I realized how grateful I am for my teeth…many of which are implants. I’m grateful to be reminded how happiness and gratitude go hand in hand …. And that you keep me on your email & Facebook lists. I’m really appreciative of the work I have, even when it keeps me fairly close to home. 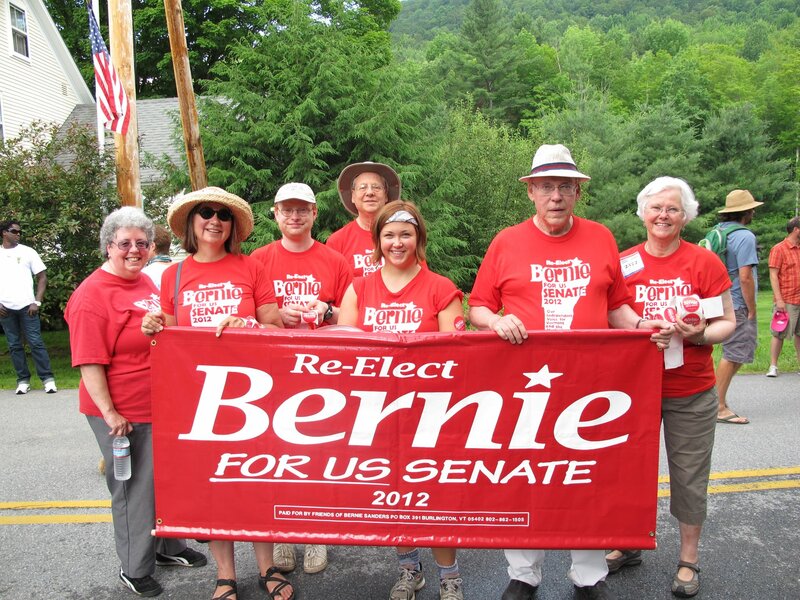 Ginny, I’m grateful for your regular messages on happiness and your ongoing curiosity about what creates it; I am so grateful to be here in Vermont where people still work at “creating a more perfect union,” as Bill Clinton reminded us yesterday was a goal of our nation’s founders. I am also very grateful for an amazing partner with a heart bigger than problems we’ve faced together. Together! 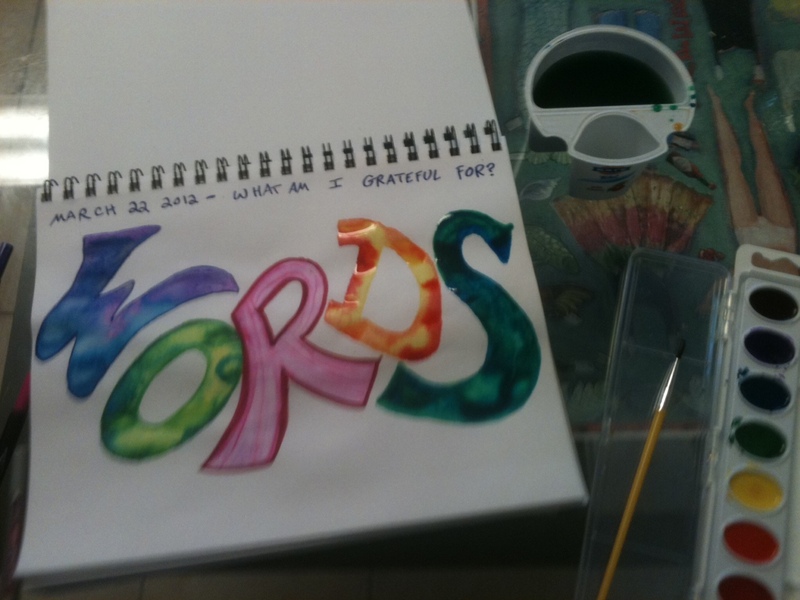 I’m grateful for that word. Silence, even though I love music. Antibiotics that kill Lyme disease. Right now I am feeling grateful for the people that have a passion and act — you in your store and how you reach out with your great loving positive energy, Linda and Paula and their big walk and listening hearts, and just a ton of people I read about and listen to that open their eyes to understand, then open their hearts for generous selfless action. I always come back to gratitude for the most basic things. I am again and again overwhelmed with gratitude for my senses – – For being able to see (beauty of all kinds) and smell (roses, lavender, verbena, pine, chocolate) and hear (music, rain) and feel and taste. I am also frequently grateful for having a soft clean bed to sleep in, a roof over my head and a safe, warm and dry place to call my own, and a fridge full of wholesome food whenever I open the door. So many others are not this lucky. In June, gratitude for the trees my neighbor planted. To all this wonderful gratitude others have expressed, I will add something to just reflect that gratitude can be for big deep things, but it can also be for little things: today I’m grateful for pure maple syrup! Our own little savings and loan down the street that only makes local loans. I am truly grateful to be able to be doing this work. Part of it is because of the wonderful people. Part because of the learning experiences. But mostly, because we are so very lucky to have the opportunity to do this work. It’s a grace not many people on this planet get. I’m grateful that my husband thought to take my RAV4 to our neighbor when I drove it ’til there were no more brake pads, and he was able to earn some extra cash, and I was able to avert driving into a ditch. I’m grateful that we have a generator as we just lost all power with this rain storm. I’m grateful that I’ve been sober 11+ years, and I’m able to be of service to women who struggle with alchoholism. I’m grateful to have a Mother-In-Law who is full of joy and laughter. I am grateful for so much, including my life and that of all beings (may all be at peace). I am grateful for connection, blessings, challenges and the opportunity to grow and share. And me? So many many things, from that first cup of coffee each morning to the glory of puffy white clouds in azure autumn skies and opportunities to be of service to others. 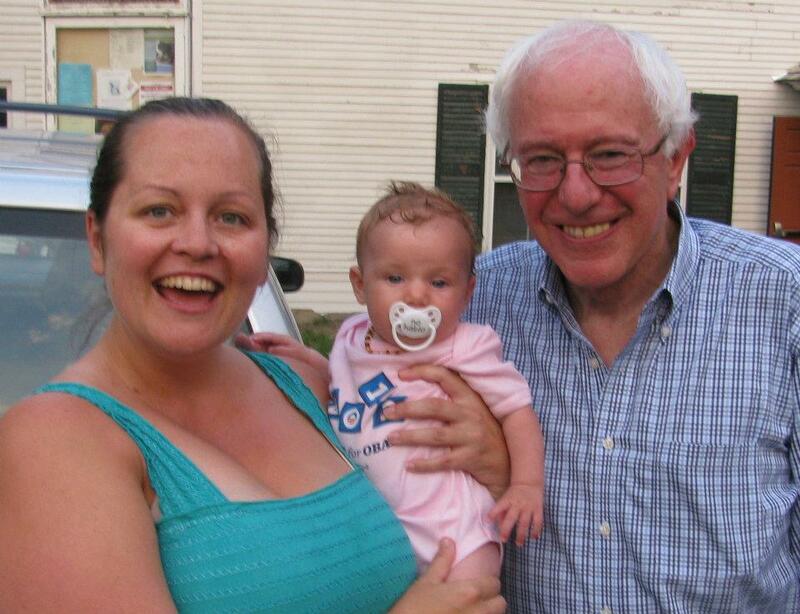 But, right now, having a six month old granddaughter (who lives with us!) trumps all else. I am in love, I am happy, and I am grateful for this precious new life. In a few days, I will leave home for nearly two months to support my daughter during the final weeks of her pregnancy, in the delivery room, and for the first month or so of my granddaughter’s life. I am excited and busy. My mind is swimming with details. Last night, though, I put details aside to be with a group of friends who held a Grandmother Baby Shower/Blessings On Your New Adventure/Please Return Safely ceremony for me. It was one of the happiest nights of my life. Happiness studies show that we each have a natural happiness level, which can be raised by developing happiness habits. Joyous events and circumstances, like the communal love I felt last night, raise our happiness level for a while. Sad, tragic, and dreary situations lower our happiness. In either case, we eventually settle back into our natural level. This morning, I’m tired (I was too wired up to sleep well!) but still enjoying a happiness upswing. Why so happy? Silly question, right? Anybody could look at the circumstances and say, of course you’re happy! You’re about to become a grandmother, your friends just celebrated your joy — and, icing on the cake, you’ll be driving away from the tedious end of a Vermont winter into sunny warm weather in Alabama. Who wouldn’t be happy? Even so, I want to break it down a bit. Grand-babies don’t come along every day, but the other ingredients of my current happiness high are available to each of us on a pretty regular basis. Gratitude. Gratitude is one of the most reliable contributors to personal happiness, and my gratitude cup is overflowing. Hugs, blessings, good food, thoughtful presents … I’m so, so grateful. I’m not very good at writing thank you notes, but I’m going to send a heartfelt thank you to send one to everyone who made last night special. Community. My town has pot lucks, talent shows, silent auctions. We take meals to people who are sick, and check on pets. We sing together, swim together, skate together, snow shoe together. It’s like a bank: we make regular deposits in our community account. And when we need a withdrawal, the “funds” are there. It’s a solid investment strategy. Forgiveness. When I looked around the room, I felt such pleasure in my relationship with each woman in the group. Because we’re human, I’ve been in conflict with some of the women in the past — conflict that we worked through together so we could move on. I’ve forgiven, been forgiven, and deepened relationships. Touch. Twice we stood in a circle holding hands. Hugs were also abundant. Gretchen Rubin, author of the blog and book The Happiness Project, cited research on hugging from The How of Happiness by Sonja Lyubomirsky. Rubin wrote about Lyubomirksy’s “study in which students were assigned to two groups. One group was the control; one group was assigned to give or receive at least five hugs each day for a month – a front-to-front, non-sexual hug, with both arms of both participants involved, and with the aim of hugging as many different people as possible. The huggers were happier.” Let’s hear it for hugs! Mindfulness. Savoring, and being fully present, are excellent happiness tools! Perhaps I’ve been sharpening those tools lately through a ramped up meditation practice. And/or, perhaps the loving energy and shining eyes all around the room were too powerful for my mind to wander, despite my pre-trip to do list. I knew I was experiencing a very special, once-in-a-lifetime event. I was definitely present, and in full savoring mode. Recycling. My friends know, I strongly believe changing our shopping habits to be less voracious consumers of Planet Earth is a requirement of our long term personal happiness. 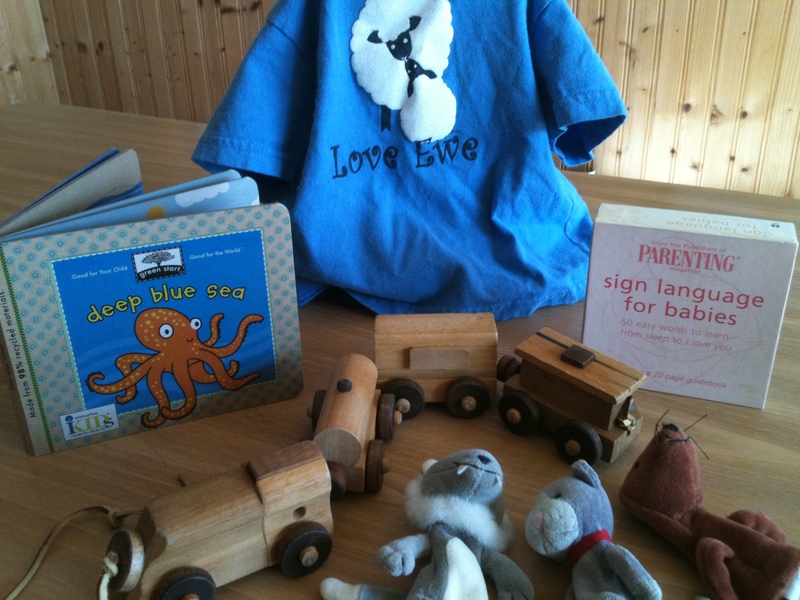 So I was thrilled that several of the presents were items previously-loved by other babies. I was especially pleased to know that my young friend Edwin (just three years old) gave the thumbs up to passing on one of his old trains to the new baby. Learning to give is good for Edwin’s happiness, too. Acknowledgement. Maslow’s Hierarchy of Needs includes the need for recognition from others (as well as internal self-eteem). In general, I try to give generously of my time, and my heart, with no expectation of any recognition (except from my faithful husband; his support is usually enough). But I just flushed with pleasure last night when one friend explained that they wanted to have this party for me because I “do so much for the community” and I “will be missed.” It makes me feel good even now to type those words! Sometimes, recognition does matter. Okay, enough analyzing. I’ll get out of my head, and slide back into enjoying the moment.